Copyright © 2015 Journalistic Inc. Seafood gives operators a versatile protein that has a sustainable, healthful halo. There’s nothing fishy about the seafood at limited-service restaurants today. Operators are focused on meeting consumers’ demands for seafood that is creative, healthful, and sustainable, from grilled fish fillets to upscale lobster rolls. According to Chicago-based market research firm Technomic Inc., 64 percent of the nation’s quick-service and fast-casual restaurants offer a seafood item, whether it’s fish tacos, shrimp fried rice, or anchovies on pizza. The number of seafood items on regular limited-service menus is virtually unchanged from a year ago, with 54 percent featured at quick serves and 46 percent at fast casuals. The most offered seafood, according to Technomic’s MenuMonitor database, is shrimp. It’s in a variety of dishes, part of many ethnic menus, and a popular add-on protein at restaurants as diverse as Noodles & Co. and Pei Wei Asian Diner. Even Atlanta-based wings chain Wing Zone serves a shrimp dish. “Almost all of our food items are fried, so having fried shrimp is easy on the operation,” says Dan Corrigan, director of marketing. “We actually changed our shrimp recently to more of a jumbo breaded shrimp, and that’s doing well.” The shrimp is served with a dipping sauce. It’s only 3 percent of the sales, Corrigan adds, but when Wing Zone tested removing the item from one restaurant, guests wanted it back. One reason fast casuals make up a big percentage of limited-service eateries serving seafood is its premium price, says Technomic executive vice president Darren Tristano. “That’s harder to translate to quick service,” he says. “Seafood’s price points are more full service or fast casual.” Nonetheless, many big limited-service restaurant operators offer at least one seafood menu item, such as the Filet-O-Fish at McDonald’s or Tuna Sandwich at Subway. Keeping seafood sustainable is more important to Americans today than ever before. “Customers are increasingly asking where their food comes from, how is it produced, is it safe, and are there any environmental issues when it’s produced,” says James Baros, aquaculture and sustainability coordinator at provider National Fish and Seafood of Glouchester, Massachusetts. He points to Atlantic cod and some tuna species as examples of how industrial fishing nearly obliterated stocks. “It was an important lesson to learn,” he says. Salmon, shrimp, and tilapia are the most popular farm-raised seafood varieties for Americans. But wild caught still has a certain cachet for diners, and many restaurants point out that their fish is wild caught. That includes the largest quick-service seafood operator, Long John Silver’s, where the classic battered and fried Fish and Chips remains the biggest seller. The fried fish is usually pollock, while cod is available either fried or baked. Shrimp, mostly farm-raised in South America, can be baked or fried, and Long John Silver’s also sells fried crab cakes and clams, with langoustine bites offered as a seasonal item. “Our seafood menu has evolved,” O’Reilly says, adding that the brand has increased its healthier options while also adding more portable items, including fish tacos, seafood-salad sandwiches, and fish strips. These steps are helping the Louisville, Kentucky–based company maintain its seafood leadership, O’Reilly says. “I believe that growth will be fueled by the addition of Millennials concerned with quality and sustainability,” he says. Battered fried fish is also the No. 1 item at Captain D’s, which has positioned itself as a fast-casual seafood dining experience. While about two-thirds of the menu is fried, the biggest growth is in grilled items, says Jason Henderson, vice president of product innovation for the Nashville, Tennessee–based chain. Double-digit growth pushed grilled food to about 10 percent of sales in 2014. The grilled menu includes Alaska salmon and pollock, tilapia, and shrimp, while the fried fish is pollock. The chain also features breaded flounder and catfish, a nod to its Southern roots, as well as fried shrimp and stuffed crab shells. Most diners don’t ask about the food’s source, Henderson says, but the menu often makes it quite clear, particularly with Alaskan fish. “We’ve worked with a long list of accounts to increase the visibility of Alaska seafood,” says Claudia Hogue, foodservice director at the Alaska Seafood Marketing Institute. The state produces 53 percent of America’s seafood harvest. In addition to white fish—cod, halibut, and pollock—Alaska is known for its wild salmon. Some salmon varieties are available year-round, but for most, the season kicked off in May and runs through the summer. There are also Alaska Dungeness and other crab varieties, along with scallops and prawns. “We encourage people to use the Alaska name because we know customers more and more want to know the origin of their fish,” Hogue says. Studies commissioned by the institute indicate consumers feel better about buying Alaska-brand seafood. 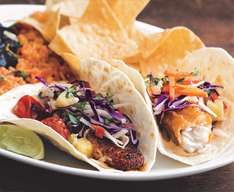 Southern California–based Sharky’s Woodfired Mexican Grill makes a point that fish served in its tacos, burritos, bowls, and other items are wild caught, and varieties like salmon and cod are from Alaska. “We’re a lifestyle brand, and many who visit us recognize the benefits of wild-caught seafood,” says David Goldstein, chief operating officer of the two-dozen-unit chain. The most popular seafood item is Charbroiled Fish Tacos featuring salmon or wahoo. Fish tacos are $4.29, versus $2.99 for chicken and $3.99 for steak. Other favorites are the Salmon Power Plate, Salmon Burrito, and Tempura Cod Tacos. Sharky’s also features mahi mahi, pollock, and shrimp, and all these offerings provide “a real point of differentiation for us,” Goldstein says. Seafood has grown to 11 percent of sales, twice what it was a few years ago. The majority of the menu is fried. In addition to cod, there’s fried halibut, salmon, clams, scallops, big and small prawns, and oysters. The menu also has several chowders, grilled halibut and salmon, Dungeness crab, and salads with different seafood varieties. “Within the past three years, we expanded the grilled items and added fresh fish,” Taylor says. “We sell it as long as the run is going.” The two-piece Fresh Halibut Platter, with cole slaw, wild rice, and cornbread, sells for $15.99. Just as consumers equate wild salmon with Alaska, they link lobsters with Maine. That’s the draw at New York–based Luke’s Lobster, which has 17 fast-casual “shacks” in Mid-Atlantic coast cities and recently expanded to Chicago. “We are exporting the experience of the Maine lobster shack,” says founder and president Luke Holden, whose father has been in the seafood industry for years and built up well-established relationships with fishermen across the Northeast coast. The $15 fresh lobster rolls are made to order in the traditional Maine style, with a quarter pound of chilled lobster meat in a top-split bun—the sides are shaved to toast better—plus a slick of mayonnaise, Holden’s secret seasoning, and lemon butter. The shacks also offer crab and shrimp rolls, Jonah crab claws, and New England clam chowder. Crab is purchased from fishermen from Maine to Rhode Island, while the shrimp is wild from Canada. Lobsters were sustainably caught long before it became a trend, says Matt Jacobson, executive director of the Maine Lobster Marketing Collaborative. Some rules governing trapping date from the 1870s. Today, lobsters must be males between 3.5 and 5 inches in body length. Others are tossed back—smaller ones to grow, and females and bigger males to breed. While many consumers consider lobsters a center-of-plate item served whole, there are many other uses for the meat, Jacobson says, including in salads, pasta, and Asian dishes. Lobster rolls are also growing in popularity nationwide. The fish tacos are available with grilled or fried fish, largely wild-caught species ranging from Pacific cod to Maine’s Acadian redfish, depending on the season. The tacos include cabbage, avocado purée, and pickled onions. Slapfish’s limited entrée menu also includes the Crabster Grilled Cheese sandwich with lobster and crab, and a Surf ‘n Turf Lobster Burger smothered in lobster and caramelized onions. There’s also fish and chips, chowder, chowder on fries, and shrimp. A taste of the Hawaiian Islands is part of the draw at Coconut’s Fish Café. The four-unit chain began in Maui, Hawaii, and has since moved to the mainland. It features mahi mahi, ono—the Hawaiian name for wahoo—and ahi. Most of the fish is grilled, and the ahi tuna is seared rare and served with wasabi. “We have big, beautiful, 6-ounce fillets of fish that if you go to a sit-down restaurant, you would pay $30 or $40,” Oney says. Coconut’s platters start at $10.99. Mahi mahi and ono are in the seafood pasta, as well as the fish tacos that include family-recipe coleslaw and tomato and mango salsas. There’s also a fish sandwich and other fried items—fish and chips, shrimp, calamari, and coconut shrimp—on the menu. This entry was posted on Monday, July 27th, 2015 at 11:02 am and is filed under Fast Casual, Health & Wellness, Price, Quick Service, Restaurant Operators, Seafood. You can follow any responses to this entry through the RSS 2.0 feed. You can leave a response, or trackback from your own site.